Objective: Wear the correct respirator for the job and make sure it fits properly. Review the information below on types of respirators and safe practices for using and fit-testing respirators. Have respirators on hand to try on for fit and to show the different types. Demonstrate how to fit test a respirator. Supervise workers while they each practice fit testing different respirators. Many jobs involve harmful pesticides and chemicals. Employers must determine what respiratory protection is needed for the job. Workers must use that protection to prevent harmful effects. Workers must fit test their respirators each time they put one on. Dual and single cartridge respirators are available to handle a long list of contaminants. They are used in the green industry for protection against pesticides, ammonia, toxic paints, and solvents. However, they are not suitable for use in enclosed spaces where toxic gases may crowd out the oxygen. Nor are they designed for use against gases that are extremely toxic even in small concentrations. They should only be used for contaminants that their cartridges are specifically designed to handle. cartridges are not available for the chemical. pesticide or organic vapor concentrations exceed 0.1 percent. toxic gases are present in an enclosed space. You have a beard, mustache, long sideburns, or a deep facial scar or deformity that prevents a tight fit. You have lung disease, heart trouble, or breathing problems. A doctor's advice may be needed before using a respirator in these situations. It has not been approved for the specific hazard you are protecting yourself against. Your eyeglasses interfere with proper fit. Fit the respirator first, then put eyeglasses on over the respirator. It is critical to perform a fit test each time you put on a respirator. You need to check for a tight seal between the facepiece and your face. Check for proper fit each time you put on a dust respirator. Cup both hands in front of the mask. Be careful not to push on the mask or move it. Inhale deeply. Check to see if the facepiece collapses toward your face. If the mask is drawn in and no air is leaking in around the edges, you have a proper fit. If you don't have a proper fit, try readjusting the straps or repositioning the respirator on your face. Repeat the test until you have a proper fit. Check the written material that comes with the respirator for other specific fitting instructions. Do a positive pressure test. 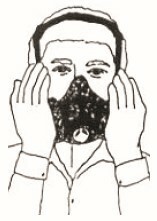 Put on your respirator and block off the exhalation valve with the palm of your hand, as shown in the picture below. Gently exhale, then hold it for about 10 seconds. 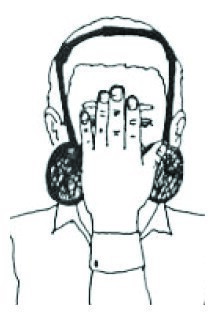 Place your hand on the facepiece to see if it is bulging slightly. Smile, then open your mouth. If you notice a slight bulge and you don’t detect any air leaks, you have a proper fit. Do a negative pressure test. Place the palms of your hands over the cartridge openings (as shown in the picture below), and gently inhale, holding your breath for 10 seconds. You will notice that the facepiece is collapsing slightly. Smile, then open your mouth. If the facepiece is collapsing slightly and you don’t detect any air leaks, you have a proper fit. Caution! You must do both a positive and a negative pressure test to ensure a proper fit. If needed, make adjustments and repeat both tests until you have a tight fit with no leaks. Respirators help protect your lungs. Choose the proper respirator for the hazards you are working around. Use the correct cartridge depending on what it will protect you from breathing in—pesticides, ammonia, dust paint sprays, or other contaminants. Read the instructions that come with the respirators and also the labels of pesticides and other contaminants. Be sure there's a tight seal between your face and the facepiece. Perform the fit tests!